Days after losing his position as leader of Assembly Republicans, Chad Mayes was entertaining lobbyists and lawmakers at a bar near the state Capitol, raising money for his re-election with a live video message from Arnold Schwarzenegger. The comment illuminated a vast schism among California Republicans, who are divided over how to bring their shrinking party back to relevancy. The very reason Schwarzenegger called Mayes the “future of the Republican party”—his work on climate change—was what ultimately cost him his leadership post. Most of his fellow Republicans voted against the cap and trade bill, even though it was backed by traditional GOP interests including oil companies and the Chamber of Commerce. Republican activists saw Mayes’ support for a program that adds costs for businesses and their consumers as a betrayal of GOP values. They turned up the pressure until he was forced last week to resign. Schwarzenegger, by contrast, saw a modern Republican taking pragmatic steps to broaden the party’s appeal in a state where voters overwhelmingly support policy to address global warming. Mayes’ ouster shows how hard it is for California Republicans to embrace a more moderate stance. A decade ago Schwarzenegger famously said California Republicans were “dying at the box office” because hard-right politics appealed to so few people in an increasingly diverse state. Since then, the GOP has slipped even further. 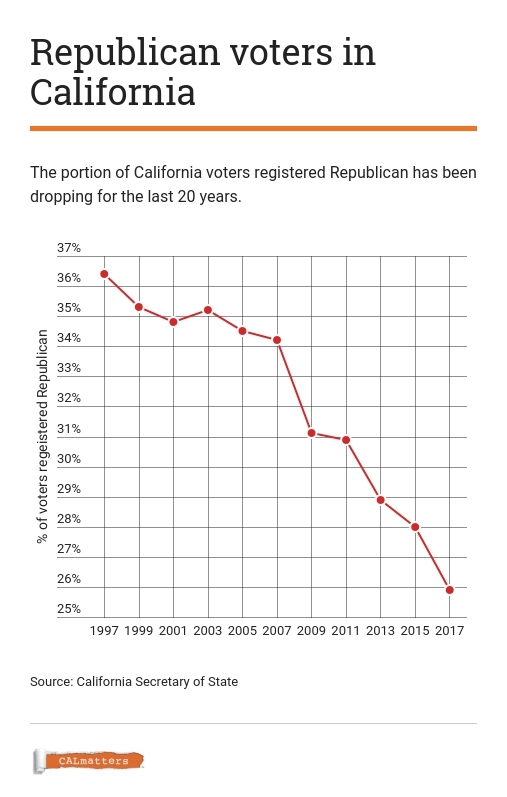 Today just 26 percent of California voters are registered Republicans, and internal polling Mayes highlighted shows 7 percent of state Republicans are considering abandoning the party because of its stance on climate change. The GOP holds only one-third of the seats in the Legislature, too few to be of any consequence on most issues. And a Republican hasn’t won a statewide contest in California since Schwarzenegger’s reelection in 2006. But Donald Trump’s victory last year, campaigning against climate policy and immigration, made it harder for Mayes to convince fellow Republicans that moderation was the key to electoral success. Even though Trump was trounced in California, he won the highest office in the land by appealing to the far right. Mayes’ cap-and-trade vote in July was the tipping point for conservative activists who wanted him out. But it was not the first time Mayes had tried to craft a different image for California Republicans. Earlier this year, he took flack from the right after the Assembly Republican caucus honored gay-rights icon Harvey Milk in a social media post. During almost two years as leader, Mayes brought his caucus to a homeless shelter and spoke often about California’s soaring poverty rate. He wrote a bill (still pending) that would give welfare recipients incentive grants for completing their education. He negotiated with Democrats on a bill enacted last year that taxes health plans to bring in more money to provide health care for the poor. Mayes and Democratic Assembly Speaker Anthony Rendon became known for their rare bipartisan bromance. Yet Mayes is hardly a liberal sop. The son of an evangelical preacher raised in a desert town near Palm Springs, Mayes opposed Democrats’ plan to raise gas taxes to pay for road repairs. He voted against bills to increase the minimum wage and pay overtime to farmworkers. He earned an A+ rating from the Firearms Policy Coalition for his votes supporting gun rights. Still, his chummy approach to Democrats didn’t fly with Republican party activists, who publicly accused him of having an extramarital affair with a former assemblywoman as the cap and trade vote loomed. (Mayes declined to answer questions about his personal life, other than to confirm that he is going through a divorce.) After the vote—and his participation in a bipartisan celebration in Gov. Jerry Brown’s office—the California Republican Party took the unusual step of formally urging Mayes to step down. Party leaders felt the cap and trade extension was both bad policy and bad politics because in delivering Republican votes for the bill, Mayes allowed some Democrats to vote against it. The Democratic supermajority had splintered over cap and trade, with some progressives opposing it as too business-friendly, and some moderates withholding support to appease conservative voters in their swing districts. Dhillon believes the new caucus leader, Assemblyman Brian Dahle, will be more reliably conservative. Dahle is a farmer who voted against extending cap and trade. His hometown of Bieber in Lassen County has 300 residents and his rural district is solid Trump country. Dahle is also known for building relationships across the aisle—he has already hosted the Democratic Assembly speaker at his home—and said Mayes’ bipartisanship makes sense in a statehouse so heavily dominated by Democrats. But Mayes “moved a little faster than the party could keep up with,” Dahle said during an interview at the Sacramento fundraiser.